Details:	The bridge is located on a State Highway near Thevally town in Quilon district. It has balanced cantilever decking with 2 main units of 30.48 M. and central suspended span of 15.24 M. The end approach spans are supported by cantilever tips. 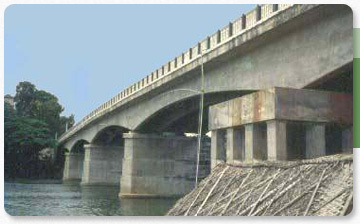 Challenge: In this bridge, one pier and an abutment suffered considerable settlement and tilting thereby adversely affecting the stability and alignment of the bridge. 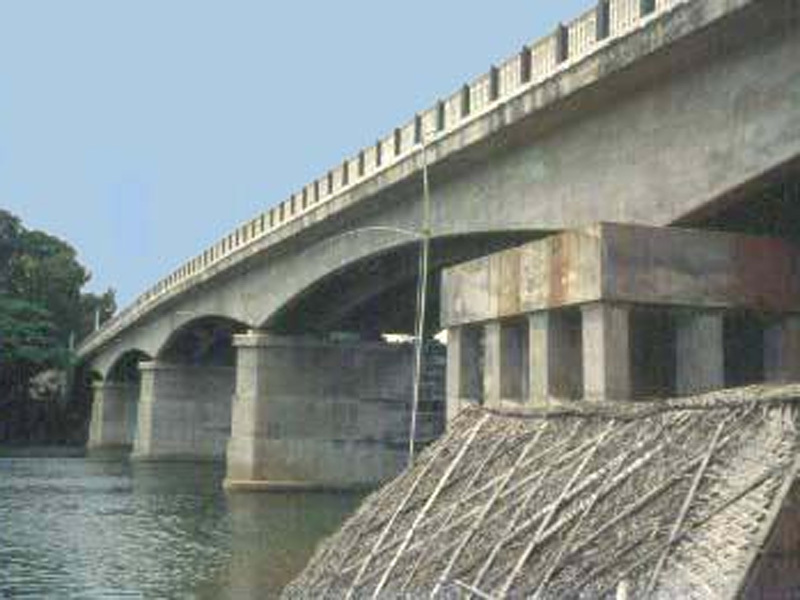 The abutment on Kadavur side and adjoining pier had settled and tilted. The settlement was 1.26 M. and 0.7 M. respectively. Due to settlement, the RCC rocker and roller bearings had cracks and because of rotation of span in plan, expansion gaps too varied substantially. Hence it was decided to construct new trestles around these foundations and transfer the load of the spans over them. i)	Construction of piling and raising pier on them for some height below the soffit of superstructure. ii) By lifting the span, the superstructure was brought to the original level position. iv)	Balance height of the trestles was constructed. v)	Side shifting of the span was done to bring it to original alignment. vi)	Neoprene Bearings were installed on new trestles and the superstructure lowered on to them.